DELIVERING UP TO 60,000 GALLONS! FOR BEST PERFORMANCE AND SAFETY. FOR RELIABILITY WHEREVER YOU ARE. 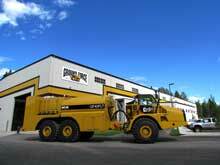 Ground Force Worldwide Manufactures the World’s Finest Mining Equipment. We are a WORLD LEADER in manufacturing support equipment and have built over 250 Fuel and Lube Trucks. Our Fuel and Lube Trucks are built mine-site tough, and offer you an innovative solution for delivery multiple products and services, safely and efficiently in your mine. Delivering custom Fuel and Lube Solutions, Water Trucks, Electric Cable Reel Trucks, Rock Spreader Trucks, Dump Bodies and more, Ground Force Worldwide is your TOTAL SOLUTION for Mining Equipment! View and Download Product Catalogs in English, Spanish and Russian. Newest Innovation in Dust Suppresion! We achieved a 5 Star CC rating back in July and the new lube trucks played a key role in getting us over the line. I have been advised that we are (1) of less than 10 mining company owned & run facilities globally, to reach this standard. Aligning ourselves with vendors like Ground Force, who provide quality solutions in niche markets, is a big part of what allows all of us, (Caterpillar®, Wyoming Machinery and GFM) to have strong, viable businesses. Ground Force Worldwide establishes and builds relationships through listening to our customers, offering innovative solutions, honoring our commitments, and exhibiting loyalty to our customers and global dealer network. In doing so, we are able to expand our brand and continue to offer opportunity to our employees and bless our community through our success. © 2017 Ground Force Worldwide. All Rights Reserved.